This is my second installment of Imperfectly You. You can check out the first installment here. This will be a monthly/bi-monthly feature where I will feature a nail polish that I find can reflect or inspire a topic that relates to self esteem and empowerment. 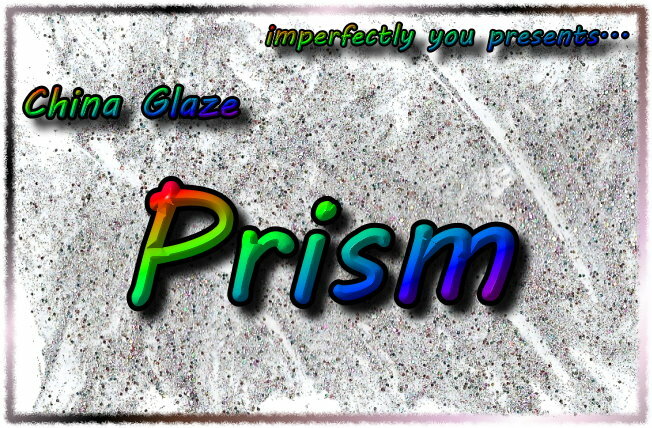 Today's topic is inspired by China Glaze Prism. I chose this polish because a prism is an object that when when it touches the light you can see a spectrum of colors. I feel that we as people are have spectrum of interests, emotions, aspects to our personality and so on. I view myself as a prism. I have many complexities and facets to my personality that make me unique! I used to struggle with the many facets and the spectrum of my personality. There are times in my life I've felt like I don't fit in with others or a part of a group. I've always had a wide array of interests and I never felt like I really clicked with a group of people the way others do. When I was younger I'd try and conform, or force myself to like certain things in desperate attempts to fit in with people. While, it may of worked to some degree, it wasn't real. I felt like a fake, and I was miserable because pretending to like bands or movies I didn't like got old quickly! It probably took me to about 22 years old to realize that I'm fine just the way I am. I can have a lot of different hobbies, interests, and sides to myself. I don't need to be one type of person to fit one mold I think is expected of me. I think I appear cheerful and fun on my blog, but that's not all of who I am. I'm also introspective and abstract, a lot of which you do not see on my blog, but it's there in other cases! I'm also a big history and art buff. I could talk about the most interesting events in history and my favorite artistic movements for hours. There are a lot of different sides to me, and I can be all of that and still make great friends and be accepted into groups of people. It's nice to know that my spectrum of colors can be embraced by others and myself! It's taken me awhile to realize this, but I'm glad I have. Would you consider yourself a prism as far as having a spectrum of interests and facets to your personality? Have you always been confident about this or did you ever hold back parts of yourself? Please share your thoughts on this topic in the comments below! I recognize a lot of myself in you, being widely interested and having the feeling I don't really connect. I always feel there are groups of friends around me and I just kinda float around those, feeling left out at times. Other moments I don't feel like that at all. Oh well, it is all part of getting older and more mature, right ;)? I think I have a lot of different facets to my personality. I do hold back because I am a listener and try to figure out what that person is like.